No Smoking Day has been running since 1983, in 2016 it sees its 33rd year with the aim being to inspire and help smokers who want to quit. 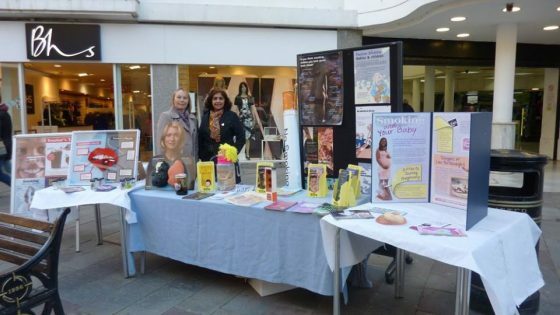 The Advanced nurse practitioner Elizabeth Borges and the Health Promotion team had a large stall set up on the day providing further information. Cigarettes contain around 4000 chemicals, many of which are known to be toxic; such as cyanide, arsenic, carbon monoxide and tar. The dangers of smoking do not stop at personal harm, but also contribute to asthma, bronchitis and poor health in the passive smokers nearby. The benefits of smoking cessation are numerous; changes to the body begin within 20 minutes and continue every day. The Smoking Cessation Clinic at the primary care centre (PCC) offers support and advice on smoking, and should be used for further information.